Where can you find Chewable Jewels? Posted Feburary 2010: I came across an article written by Mark Stibich, Ph.D (About.com Guide updated February 4, 2010). I personally love to smile and love to see people around me smiling, especially my three children. Your dentist can help with taking care of your smile by helping you maintain a healthy mouth, teeth, gums and all! If we take care of our teeth, we do not mind smiling big for the camera, smiling at others, and showing off our teeth. On the other hand, if we do not take care of our teeth, we might limit the amount we want to smile! I am going to challenge myself to remember to smile more and I hope all of you will do the same. It seems to good to be true but try and smile more and you will see the how it helps very quickly! Read below and see all the benefits of smiling that Dr. Stibich lists! Just reading the list makes me smile! Smiling is a great way to make yourself stand out while helping your body to function better. Smile to improve your health, your stress level, and your attractiveness. Smiling is just one fun way to live longer read about the others and try as many as you can. We are drawn to people who smile. There is an attraction factor. We want to know a smiling person and figure out what is so good. Frowns, scowls and grimaces all push people away — but a smile draws them in. Next time you are feeling down, try putting on a smile. There’s a good chance you mood will change for the better. Smiling can trick the body into helping you change your mood. Try this test: Smile. Now try to think of something negative without losing the smile. It’s hard. When we smile our body is sending the rest of us a message that “Life is Good!” Stay away from depression, stress and worry by smiling. Posted on November 9, 2009: As a new mom again, I find myself searching for safe products that make my life easier, especially during difficult stages such as teething. Even as a dentist, I am obviously not exempt from this stage of growth. My children have to go through the teething pain and I find myself searching the market for the best teething solutions for them. I also find that so many moms and caregivers have questions about teething, teething pain, and how to help their little one through the process. Now that I am in their shoes with two under the age of 15 months, I feel that I can offer my own personal opinions and entertaining trials and tribulations as a mom and dentist with the hope that I can help parents and caregivers everywhere! Maybe just one funny story, one example, a picture, or video can touch the life of a mom or dad that are sleep deprived and trying to take each day at a time! We can go through this process together. We can handle the teething pain, the late nights, the sore gums, and midnight feedings! We at Dr. Bloom Inc, founded our company to create safe products for families everywhere. Now I hope Dr. Bloom Inc can continue helping by offering this blogging resource to families. This is an avenue to hopefully help you cope with the teething process and the other developmental milestones that we all love to journal. Join me on this journey. I love to hear funny stories and I will hopefully be able to share some with you. This is my daughter, Sara Lane, at 10 months. As you can see, her front two lower deciduous centrals(O and P) are erupting….and she loves our chewable jewels! Do you have any cute pictures of your children showing off their teeth? We would love to see them and share them with our readers! Please send them in info@docbloom.com ! I do not want to ruin the mystery for those little ones who still believe in the magic of the tooth fairy. During this holiday season where “those who believe receive” from Santa, I have been reminded of the figment of imagination closest to my Dentist heart, the tooth fairy. The tooth fairy is right up there with the Easter Bunny and Santa Clause in the mysterious figments in the innocent minds of children. Many people have asked me what the going rate for a baby tooth should be these days. What works for me and my children is based on their age. I do $5.00 for 5 years old (or you could do 50 cents) and then $6.00 (or 60 cents) when they lose a tooth at six years old. However, if you are one of those who keeps track, a dollar for the first tooth, 2.00 for the second, and so on is another way to go. My sister and business partner at Dr. Bloom Inc said that you really have to budget the amount given if you have multiple children loosing teeth at the same time. She has twin boys that are loosing teeth constantly. One twin is hoping to get his two front teeth for Christmas! The dollar amounts would get expensive in their house hold. She sticks to the 50 cents for five years and 60 cents for six years and she hopes they do not talk to their cousins about what they get! She does however give them a cool $2.00 bill for the first tooth lost! The bottom line is that there is not a “right” amount. You just need to be consistent with each child because the siblings will keep track! There are many cute tooth fairy pillows on the market. Anything that is tethered under the pillow or can rest next to a sleeping head vs underneath is what I prefer. In closing, do not be alarmed when you see the deciduous (baby) tooth out of the mouth. Baby teeth tend to have long spindly sharp roots and can look strange. Oh, and to spice life up a bit….buy a tutu and wand for the tooth fairy in your house to wear. A dad looks really funny in a pink tutu! However, remember, no pictures:) You don’t want the little ones to come across these pictures. I am not sure what would be worse…to see Dad in a tutu or to find out that Dad is the Tooth Fairy! 🙂 🙂 🙂 🙂 Have a good Thursday and don’t forget to brush your little ones teeth! Posted in 2009. We have all heard “an apple a day keeps the doctor away.” Well, I think this is especially true with your dentist. As a dentist, I hope children only have to go in for regular check-ups or sealants and not for cavities! Snacks are a major part of our children’s lives to keep their bodies and minds fueled. During this entire month, your child will probably have several holiday parties to attend with friends and family, at school, at church, and in their stockings on Christmas Day! I know my children will have some of these holiday treats but it is important to make sure they brush their teeth and try to make healthier snack choices. They don’t need to fill the entire month eating candy! Try to keep some healthy choices on hand. These snacks are actually better for me as well! 1. Peanut Butter Apple – Core out an apple and fill with peanut butter. Children love biting into the apple when they see the delicious brown peanut butter. 2. Edamame – My son loves it. Lighty salt them….the perfect balance of protein and carbohydrate. These are easy to freeze and thaw out as needed. 100% natural!!! -Celery sticks filled with peanut butter, cream cheese or hummus and topped with any of the following-raisins, apple dices, seeds, nuts, banana dices, etc. These are great snacks for Toddlers! 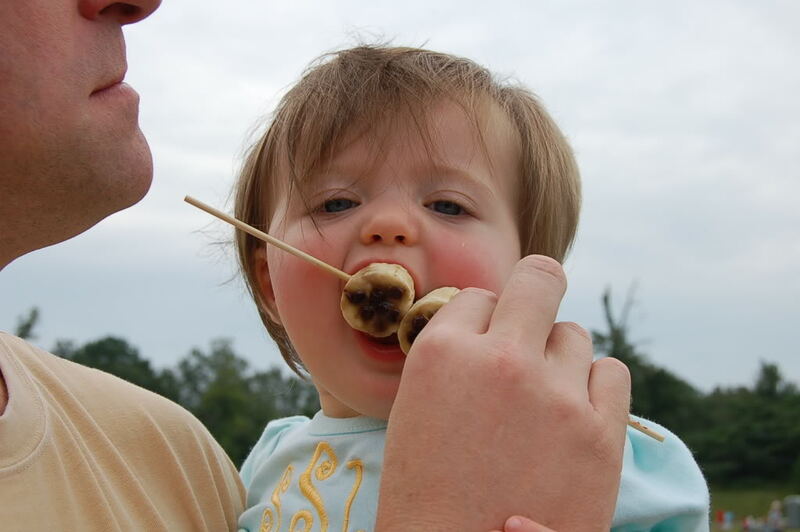 Many toddlers will just eat the “filling” and the raisins, which is just fine! Ensure what you add is appropriate for your Toddler. My children actually enjoy helping me make them and they seem to enjoy eating them because they were part of the preparation! *Mix cinnamon, wheat germ and raisins into the applesauce. Spread over the graham crackers. Use any type of fruit purée you wish! If you use low salt saltines, low-salt Ritz, pita bread slices, or plain rice cakes as your cracker base, it is just as good!! If you have any additional healthy recipes to share, please write in and share them with us! Posted in 2009. Happy Friday everyone! 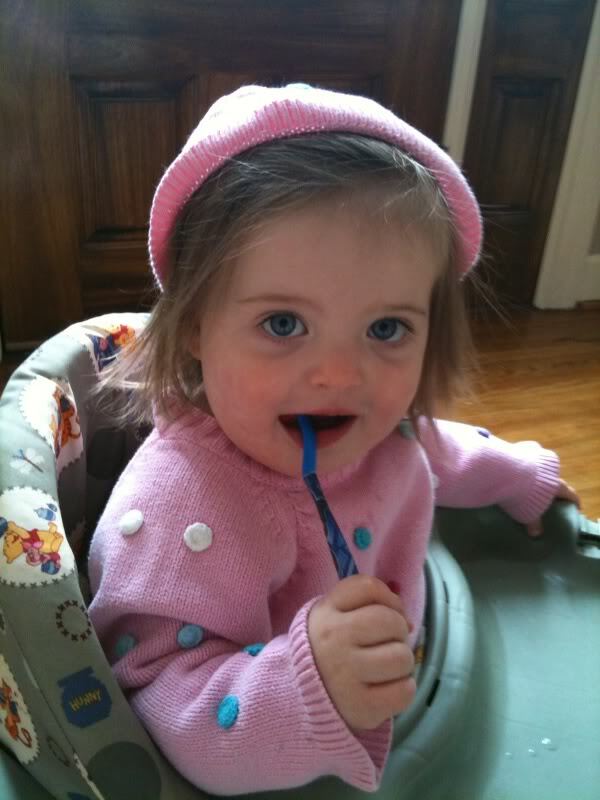 As you can see from this photo, my daughter loves brushing her teeth and her teething bracelets from Dr. Bloom’s Chewable Jewels. Look carefully at her toothbrush. She took this batman toothbrush from her older brother. I am proud that she wants to brush her teeth, but toothbrushes carry bacteria. Our mouths are colonized with an abundance of bacteria and strep mutans in particular can cause decay of teeth. Babies are born wihout this decay causing bacteria, but at some point it may be introduced (spread from one mouth to another when they share toys and other items). Encourage your children to brush, but encourage them to use their own toothbrush! She must have figured out this wasn’t her toothbrush when she threw it on the ground right after this picture was taken (probably not but it would be nice to know that she understands how germs spread at age 1). Also, please supervise young children when they have a tooth brush! Too many children fall with tooth brushes in their mouth-on that note, they should not walk around with a toothbrush in their mouth! They should stand at the sink, brush, and have a “home” for their toothbrush so they can find it the next time they brush. My children have a toothbrush holder next to the sink. Also, supervise how much toothpaste they are using and make sure they spit it out once they brush! My sister said that her three boys love this part. She thinks they actually see who can make the biggest mess of the sink! How can three little boys, ages 6, 6, and 9 mess up a sink and counter that much with one brushing? Maybe that could be a new form of art, instead of paint, they can spit the toothpaste at a canvas! My nephews would love that activity! Maybe I can do that with them the next time I visit my sister!!!! In summary, teach your children about how to be safe when brushing. I will leave you with this Dental thought for the day. We are told not to run with scissors and we also need to remember the same with tooth brushes (especially while in the mouth). If you have any funny toothbrushing stories, please share them with us. Feel free to post comments or questions as well! Have a wonderful weekend! Posted in 2009. On the toothbrush note, I use stage toothbrushes with my three children. My 5 year old is in a small head soft bristle toothbrush-stage 3. He still has 18 baby teeth and now has 2 permanent teeth. My one year old daughter has 8 fully erupted teeth, and 4 partially erupting molars. 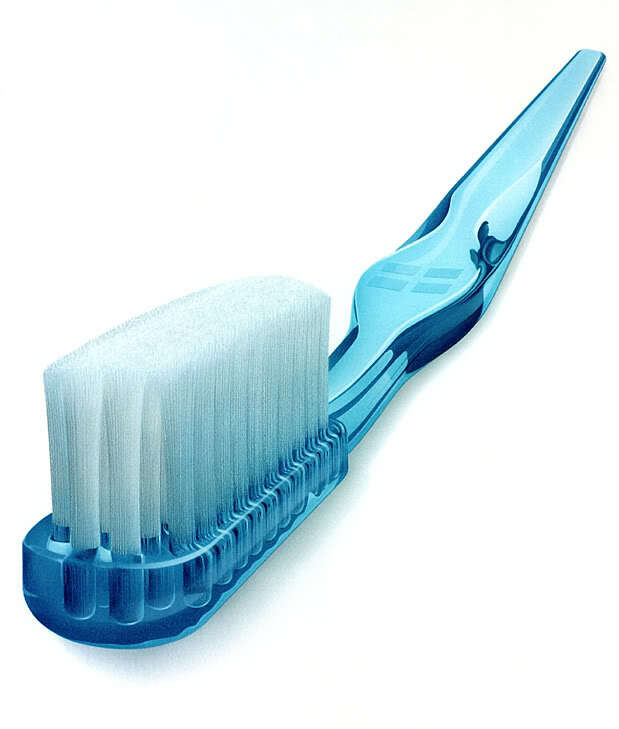 I use a small head soft bristle toothbrush and a finger cot to massage the gums! Finally, for my little 4 1/2 month old, a 2 x 2 gauze or a small clean wash rag with water and a finger cot works best for his gums. As soon as a tooth erupts, I will use an infant toothbrush (very small). If you have questions about the tooth brush for your child, you can always ask your dentist at your child’s next appointment. I can also give you my opinion if you let me know the child’s age and number of teeth they have but your dentist will be able to look into your child’s mouth and give you a great suggestion! If you have some additional items that we can add to the list that your child has used to brush their teeth, let us know!